Clued in Kids was launched in 2013 by a Helen Bertelli. Creating treasure hunts for a living was always a childhood dream of hers and making her dream come true was quite a journey. She started out creating treasure hunts for children in her neighborhood and when she had her own children she continued creating treasure hunts for them. It was then that she realized 3 things about treasure hunts: they were an incredible, memorable way to teach; they got children moving; and they remind us that life is a journey to a treasure and that if learning and laughter occur along the way, the destination doesn't really matter. Helen's story is quite an amazing one so make sure you visit the website to learn more. What child (or adult for that matter) doesn't love scavenger or treasure hunts? I absolutely love the Clued In Kids motto, “Treasure The Journey," because that is exactly what our family does on a daily basis. We treasure the fact that we are able to homeschool and go on adventures daily. And we treasure that we get to spend time learning and having fun together. Part of that learning fun for us is geocaching and scavenger hunts. Every week we go on an adventure, armed with our gps in search of a hidden treasure. And for the last year I have been creating my children scavenger hunts for our road trips and visits to various attractions and museums. 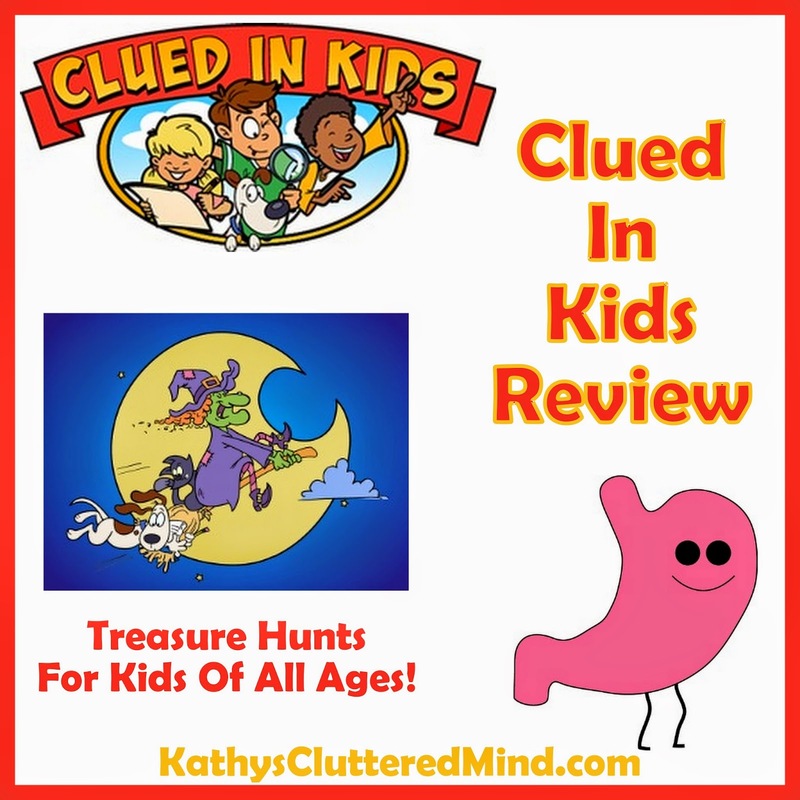 So when I learned about Clued In Kids I totally jumped at the chance to review the treasure hunts. I know first hand how educational a scavenger hunt can be! We received the Halloween Treasure Hunt and the Happy Tummy Treasure Hunt. But these are just 2 of the many options available. There are pdf versions as well as clue pads. The two we received were pdf versions. The nice thing about the printable version is that you can use them over and over again. So if you have a group of friends visiting for the day you can introduce them to learning with Clued In Kids too! It takes just 8-10 minutes to print and set up the treasure hunt and children will have 20-30 minutes of learning fun. The Clued In Kids treasure hunts are suitable for children ages 4 and up. As for the final treasure it can be anything you wish. I stopped by Dollar Tree and picked up a few goodies like dress up clothes and magnetic doodle boards. 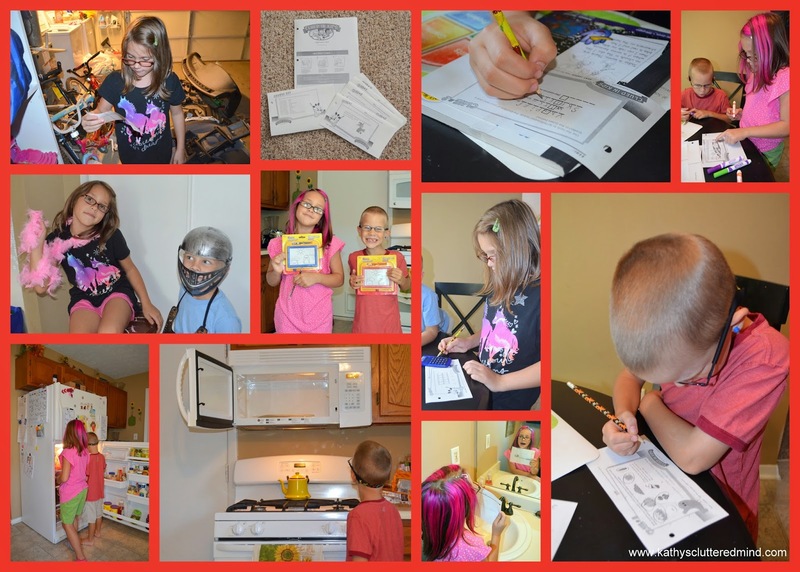 These treasure hunts were perfect for our unschooling style and are great for all learning types. They are also perfect for children with special needs and ADHD. My 7 and 8 year old had a blast and were able to complete the activities with very little assistance. They took turns finding the clues so it was a great lesson in teamwork too. Be sure to watch this video to see exactly how it works. Trick or Treasure? The Halloween-themed treasure hunt is great for helping children burn off all that candy they have collected. There are a total of 12 clues to print and hide and each clue has the exact instructions on where to hide them printed at the bottom. Some of the clue hiding places include broom, form, cereal, bike, etc. We didn't have a pumpkin yet which was were the final clue needed to be hidden, so I improvised and hid the clue on our Fall door hanger which happens to have a pumpkin on it! There were also fun activities children had to complete to get a clue from the clue holder (aka mom) like howl or say boo! This treasure hunt is great for 1-10 children. Activities children need to solve include solving riddles, finding hidden pictures, decoding messages, solving math problems and more. The Happy Tummy Treasure Hunt helps children learn about health and nutrition. There are 12 clues to print and hide and each clue has the exact instructions on where to hide them printed at the bottom. Some of the clue hiding places include: bed, coats, microwave, bath etc. And there were also some fun activities children had to complete to get a clue from the clue holder (aka mom) like eat a healthy snack (the children really enjoyed this one). This treasure hunt is great for a single child or a group. Activities children need to solve include decoding messages, learning what nutrients are, finding hidden objects, and more. If you are looking for a way to boost your child's critical thinking skills and get them away from the screen for some good ole' fashioned learning and fun then definitely try Clued In Kids. Believe me when they find out there is treasure involved they will totally be on board! Visit the Clued In Kids website and subscribe to their newsletter to receive a FREE Homework Reward Treasure Hunt. I really liked the treasure hunts. They were lots of fun and we learned some neat things too. My brother and I took turns running around the house to find the clues and at the end we got special treasures. One time the treasure was even hidden in the refrigerator. Sometimes finding the clues were a little hard because we have multiple sock drawers and beds. Printable treasure hunts are $5.99 and clue books are $8.99 both can be ordered from the Clued In Kids website. Click here for more Clued In Kids reviews (many different products were reviewed) from the The Schoolhouse Review Crew.